Landscape and cloud study by Luke Howard, c 1808-1811. 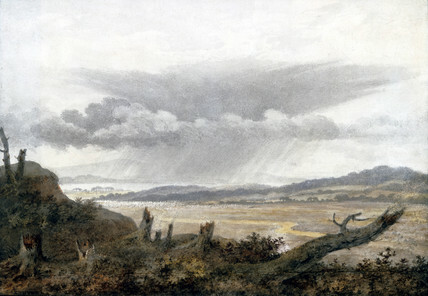 Watercolour sketch by Edward Kennion with cloud studies by Luke Howard (1772-1864). Ordering and classification were important features of Enlightenment science. Fascinated since childhood by the weather, and clouds in particular, Luke Howard classified and named different cloud types between 1803 and 1811, providing sketches for these later illustrations. His work is believed to have influenced many of the landscape painters of the Romantic era, including Turner and Constable. Although never trained as a scientist, Howard's contribution to the developing science of meteorology led to him being made a fellow of the Royal Society in 1821. His terminology and symbols are still largely used to describe clouds today. Rural landscape and cloud study by Luke Howard, c 1808-1811. Rural landscape and cloud study by Luke Howard, March 1849. Rural landscape by Luke Howard with children playing by a cottage, c 1808-1811. Cloud study by Luke Howard, c 1808-1811. 'Make the Most of the Autumn Days', SR poster, 1939. 'Chesington Zoo', BR(SR) poster, 1956. Milne-Shaw seismograph No 1, 1914. Geophysical prospecting methods used in archaeology, late 20th century.